Both male and female children love to play with tea sets as part of their dramatic play. We have previously owned a ceramic tea set, but inevitably cup handles, plates, etc. broke. You also have to be cautious when purchasing a ceramic tea set to be sure the glazes do not contain lead. A few months ago, we discovered Magic Cabin’s Children’s Tin Tea Set. 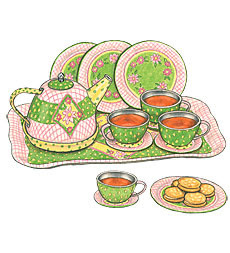 This little tea set is durable, aesthetically pleasing to little people, and comes with 15 individual pieces. The only drawback is that the Children’s Tin Tea Set is made in China. Real liquids can be placed in the cups and tea pot, but these liquids should be at room temperature since the cups are made of tin. My son likes to play with it at the sink and practice his pouring skills. Sand also provides another medium to practice and experiment with pouring. 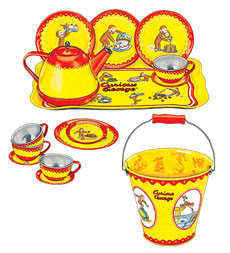 Magic Cabin also offers a Curious George Tea Set, if you are looking for a tea set with a gender neutral design. 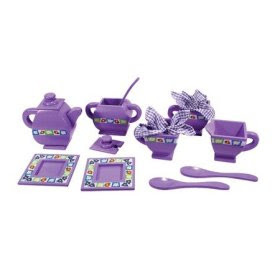 The pail, along with the Curious George Tea Set, makes this set perfect for taking to the beach or garden. Both Magic Cabin sets cost about $16.00. is always part of the play. ya i bought miniture teapot set for my daugther for her doll house and she is loving it. but she has to be very careful not to drop them or break it. they are really tiny..made of porcelain as well..
What awesome little tea sets. I’ve never understood making teasets out of porcelain & glass for small children. I bought a vintage metal set from the 50’s for my little one’s. No paint, just designs stamped into the metal so hopefully it’s ok for the kids to play with. I looked at the wood set a while back and really liked it, but I was disspointed when I found out it only had two cups.